Fun casino Blackjack is played against the dealer. Each player receives 2 cards and the dealer one card. 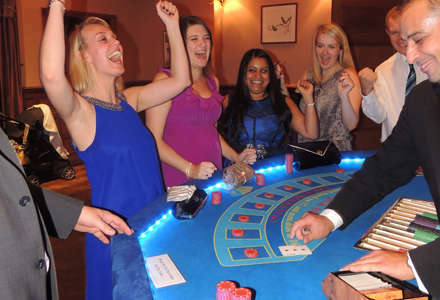 From left to right, the players then have the opportunity to take more cards (draw) or stick with what they’ve got (stand) in an attempt to make a total to beat the dealers hand. If the cards total 22 or more you lose. Each card counts at face value with Jacks, Queens and Kings counting as 10. Aces count as 1 or 11. The best possible hand is a ‘Blackjack’ which is any ten or face card with an Ace. When all players have finished playing their hand, the dealer then takes cards to finish his hand. If the dealers total is 16 or less he must draw another card. If the dealers total is 17 or more he stands. If the players total is higher than the dealers total without going over 21 he wins even money. If it is less he loses, and if it is the same it is a ‘stand-off’, i.e a tie. Blackjack vies for the top spot for popularity along with American Roulette, and Blackjack certainly holds the popularity crown in USA casinos. It is a fun, involving and easy to learn card game which will appeal to players at all levels. 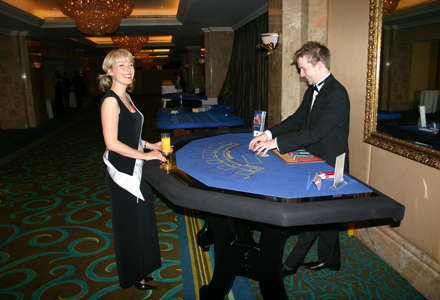 Our Blackjack tables are full sized casino tables and have 9 boxes. This means that 9 players are each able to play their own individual hand. Blackjack is played against the dealer. Each player receives two cards and the dealer one card. From left to right, the players then have the opportunity to take more cards (to draw) or stick with what they’ve got (stand) in an attempt to make a total to beat the dealers hand. If the cards total 22 or more you lose. Each card counts at face value with Jacks, Queens and Kings counting as 10. Aces count as 1 or 11. The best possible hand is a ‘Blackjack’ which is any ten or face card together with an Ace. When all players have finished playing their hand, the dealer then takes cards to finish his hand. If the dealers total is 16 or less he must draw another card. If the dealers total is 17 or more he stands. If the players total is higher than the dealers total without going over 21 he wins even money. If it is less he loses, and if it is the same it is a ‘stand-off’, ie a tie. There is an element of skill involved to increase the chances of winning at Blackjack, but our croupiers will guide your guests and offer advice on what one should do in a particular situation. Everyone can be a pro within a few hands! Further bets on the Blackjack table include splitting which is the process of adding further chips to the original bet in order to split the pair of cards into two hands which are then played individually and also to double down on an initial two cards. By doubling down one can increase the bet by up to the same value again and are effectively buying one more card and one card only. • Blackjack is similar to the game of Pontoon but the main differences are that there are no ‘five card tricks’ in the game of Blackjack and that if you tie with the dealers hand it is called a ‘Push’. In Pontoon a tie will lose for the player, but in Blackjack the player keeps the bet. • There are professional card counters that can maximise on winning a game of Blackjack by being able to mentally keep track of cards dealt already. The real casinos have thwarted this by playing with multiple decks and also with the introduction of automatic card shufflers. Dealers place the played cards at frequent intervals back into the automatic card shuffler which means a card counter never has the opportunity of seeing a whole shoe of cards played out.